As styles are managed independently from articles, it's possible to change the style an article is using at anytime. An article can be changed from two locations, either from the article manager or from the article builder. The style of an article can be changed from the article manager. This method is useful when you need to change the style of a number of article and do not need to see how the style will affect the design of the article. Access the 'Article Manager'. A list of all existing article will be displayed. Select the edit menu by clicking on the spanner icon next to your chosen article. Choose 'Edit Item' to display the article properties. 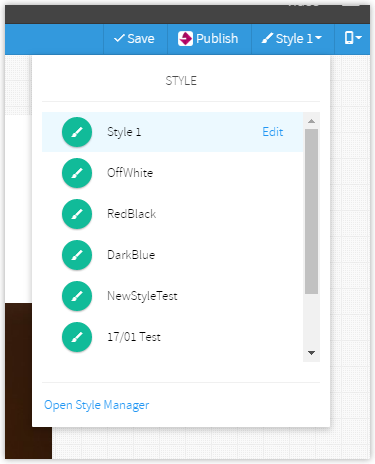 To change the style, select the Style menu and choose from the list. To save the change, press 'OK'. The article is now updated with your new style choice. The style of an article can be changed on the fly when editing an article. This method is useful when you need to see how a new style will affect the design of an article. Access the Article you want to edit. The article builder will load. From the article toolbar, click the style menu (at the top right) and select the style you want to apply. 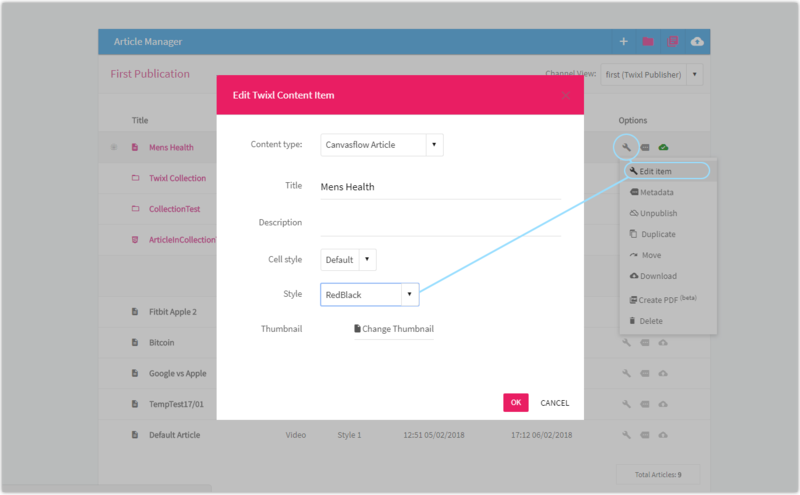 Once the required style has been applied, click outside of the style menu to close the panel. Click 'Save' to apply the style change.